Born in Harlem, Gertrude Berg credited most of her humorous stories to her grandfather, a Russian Jewish immigrant. When her parents took over the operation of a boardinghouse in the Catskills prior to World War I, the young Berg entertained boarders with skits and various acts. 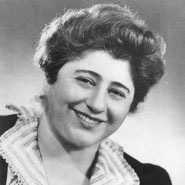 Berg became one of the first women to create, write, produce, and star in a long-running hit radio show when she premiered her 1929 serial comedy-drama about an American Jewish family, The Rise of the Goldbergs. In 1949, the show transitioned to television, with the famous opening line: "Yoo hoo, Mrs. Bloom!" In the show's first year on television, Berg won the first Emmy Award ever given for Lead Actress in a Comedy Series.